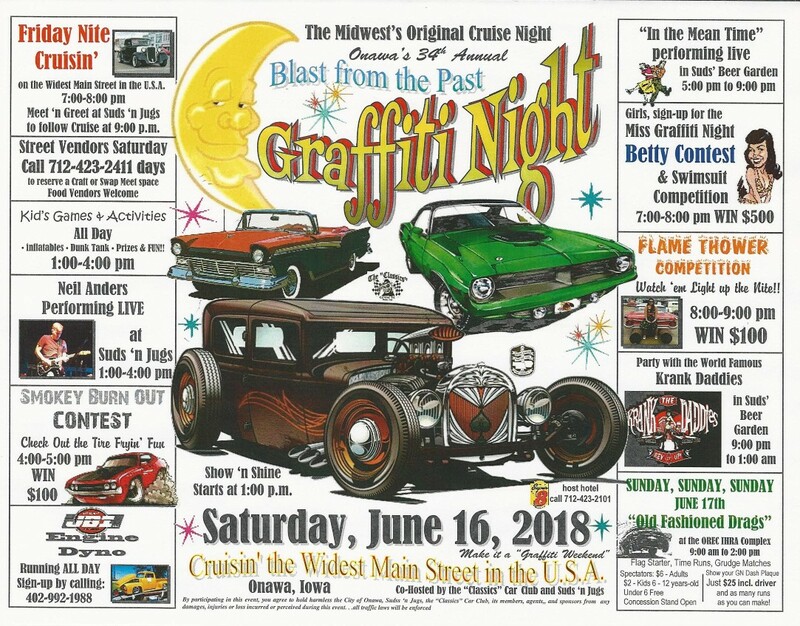 Come join the “CLASSICS Car Club and Suds ‘N Jugs Bar & Grill on “The Widest Main Street in the U.S.A” for our Nationally-recognized Blast from the Past Graffiti Night now in its 34th year in Onawa, Iowa. MAKE IT A GRAFFITI WEEKEND!!!! Special Kick-off Downtown Cruise on Friday Nite, June 15th followed by a Meet n’ Greet at Suds ‘N Jugs in downtown Onawa. Come back downtown on Saturday, June 16th for the Midwest’s Original Blast from the Past Graffiti Night Show ‘n Shine downtown. Registration starts at 1:00 pm and the show goes until 9:00 pm. Lots of activities lined up for the entire day – 3 live bands including the headliner The World Famous Krank Daddies on stage from 9:00 p.m. to 1:00 am, activities for the kids, flea market & product vendors, sign-up early for the Burn-out Competition, Engine Dyno, Miss Graffiti Night “Bettie” Contest, and Flame Thrower Competition. See flyer for details and times. There will be a special beer garden area, lots of delicious food and some of the hottest Rods and Koolest Kustoms from all over the Midwest. Over 300 cars registered last year (as many as 600 in past years). To end the weekend, blow off some steam at the new, OREC I.H.R.A. facility just south of Onawa for some good Ol’ Fashioned, Flag Start Drag Races on Sunday, Sunday, Sunday, June 17th. Watch our Facebook page for more information and announcements as the event gets closer. Best of all, it’s family-friendly and FREE to spectators and participants alike! !